Sociopath or Pathological Liar: What Difference at this point does it make? A Sociopath is an individual who has been medically diagnosed with Anti-Social Personality Disorder. This mental illness is a chronic condition in which the feelings and rights of other human beings are totally marginalized by the Sociopath. In some instances, this type of mental disease can be so acute that the affected person believes they are above the law, and they often show no shame for callously breaking societal rules and norms on a routine basis. The most obvious Sociopath symptom is total disregard for the principles of right and wrong. The Sociopath possesses a warped sense of superiority, and a lack of empathy for other people. This means they are out of touch, and unable to comprehend or recognize what others are dealing with. Quite frequently, Sociopaths feel no remorse about hurting others, and often may try to manipulate people for fun or personal gain. Sociopaths regularly use lies, deception and charm when attempting to manipulate people, and this behavior makes it quite difficult to accurately identify them. But in some cases, the Sociopath may be outwardly hostile and aggressive, especially when challenged or caught in their web of deceit. A Pathological Liar lies instinctively and spontaneously, usually without perceiving the consequences of their action. They lie on a regular basis when no benefit is gained from it, or even if they unwittingly ensnare themselves in a cobweb of falsehoods. A Pathological Liar cannot restrain their instincts to lie and it is usually a vanquishing, personal characteristic. A Pathological Liar will resort to spewing lies, regardless of their situational awareness, because lying behavior has become second nature and is deeply engrained into their personality. As such, a Pathological Liar lies out of habit. Lying is their normal manner when responding to questions. Speaking the truth is unwieldy and difficult, while deception feels proper and natural. Pathological Liar is not a documented psychological disorder, but Sociopath is recognized as such by the Diagnostic and Statistical Manual of Mental Disorders published by the American Psychiatric Association. 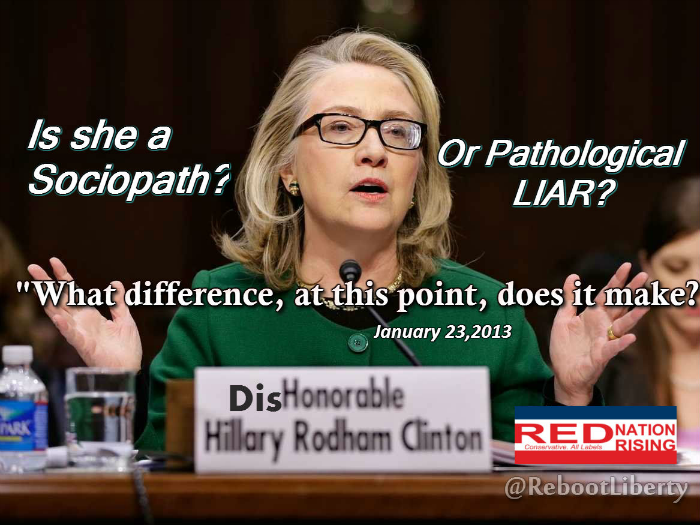 Hillary Clinton is a notorious liar and in fact she may be simultaneously a Sociopath and a Pathological Liar. Let’s examine three of her well-known deceptions and analyze the most likely pathological reasoning behind those lies. 1. In the aftermath of the Benghazi Consulate attack, Mrs. Clinton repeatedly lied about an obscure, independently produced, anti-Muslim video as being the cause of a spontaneous assault on the American diplomatic facility in Libya. Her obvious motivation for this lie was Control and Manipulation over the reporting of this heinous terrorist event. That phony talking point was also concocted to protect herself and Mr. Obama from ridicule and public discovery of the actual, clandestine reason that Ambassador Chris Stevens was in Libya. 2. Mrs. Clinton continually lied during press interviews about landing under sniper fire in Bosnia during her initial arrival for a planned visit to that nation as First Lady. This pathological lie is a classic example of Hillary desperately wanting Sympathy, Admiration and Popularity, based on a harrowing incident that she supposedly, bravely endured. Later, when challenged by videotape of the incident, Mrs. Clinton was forced to begrudgingly recant her fake storyline. 3. Hillary claimed she was named after Sir Edmund Hillary, the world famous rock climber, who (accompanied by Tenzing Norgay) was the first man to reach the summit of Mount Everest on May 29, 1953. This is a preposterous proposition because Hillary Rodham was born on October 26, 1947. The blatant lie was scripted in Hillary’s head because she wanted to feel Important, and cover up some of her inner Insecurity. Just last month it came to light that Mrs. Clinton committed several criminal acts when she used a personal email account and server while working in her position as Secretary of State. She ultimately decided on her own which of her emails were in the public domain and which were to be kept private. She of course subsequently erased her email server, committing yet another flagrant felony. What Difference at this point does it make? Please allow me to inform you what difference it makes. It is not important that Mrs. Clinton is in fact a Sociopath or a Pathological Liar. She is probably both rolled into one extremely wicked, evil woman. Most likely, she cannot be helped by any known psychiatric, pharmaceutical, or beads and rattles remedy. But more importantly to the continued longevity of the United States of America, Hillary Clinton cannot be trusted with any political power at any time because she would ultimately foment upheaval and the destruction of our nation. My advice to the GOP: Let Mrs. Clinton talk. Allow her to have a wide berth. Give her the latitude and a generous public forum during which her own lying words will ultimately convict herself in the eyes of enough members of the electorate that she will easily be defeated in November 2016. Currently out on the campaign trail, Hillary and her vast array of public forum managers are desperately attempting to control Mrs. Clinton’s urge to talk. Her handlers realize that she is the source of her own undoing and they, along with a lap-dog media are trying to protect Hillary from herself. But ultimately, I believe that the narcissistic urge to lie is so deeply rooted in Mrs. Clinton, that she will not be able to stop herself. Here is my political advice to the Republican presidential candidates: Finish Hillary off by boldly exposing her lies. Do so with courage and conviction. Do not cower in the face of the inevitable onslaught of media excoriation. Hey GOP Leadership, true conservative public policies will eventually save our nation. In the final analysis, true conservatism is the only way to return America to her greatness. A political campaign is tantamount to a sales pitch. Learn how to aggressively “sell” your candidate and your conservative public policies to the electorate for the definitive good of the nation. And always remember this: True conservatives cannot and must not compromise in a bi-partisan manner with members of the Communist Democrat Party because those politicians are trying to collapse America and bring about a Marxist Revolution on American soil. Being president is almost entirely about character. Mrs. Clinton’s basic character is evil, heinous, and warped. She is totally unworthy of the fiduciary trust of the American people. Therefore, we cannot ever give her any amount of political power. Hillary is indeed a world class, Champion Liar. Originally published at SHRMedia.com – Published here with author permission. Kerosene Cowboys by Dr. Randy Arrington is available on Amazon.com. Dr. Arrington was a recent guest on Radio Red Nation Rising. I tried googling this, would you provide more detail of the clandestine reason?